Lucene only provides the ability to search and nothing else. The rest requires a developer to create a full enterprise search solution. To help in this area, MobilVox provides libraries that give developers a framework to work on that provides the necessary advanced enterprise search features. 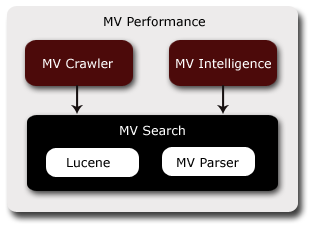 MV Performance is the total Lucene based enterprise search solution. MV Performance is comprised of pluggable libraries that have been well tested and optimized. MV Search is a wrapper around Lucene that offers the ability to scale the indexing and searching of documents. MV Search is configurable and allows fine grained changes to Lucene settings. MV Search can crawl any type of filesystems or Microsoft Outlook email. MV Crawler provides a multi-threaded and highly customizable solution for crawling website content. It can be configured to download different kinds of content, from regular HTML files to pictures and PDFs. MV Intelligence provides the advanced features for enterprise search solutions. Enhancing search through the collaboration of users with a tagging service that enables users to interact with the system and make it better. Document summarizations can be created, enhancing the speed in which the document is found. A category service gives the ability to find documents faster based on categories instead of keywords.